Jimmy Kimmel went on a highly relatable rant about 'Costco etiquette,' provides LOLs in bulk. Costco is a pretty magical store. Where else can you buy a gallon of yogurt, a dog bed big enough for a horse, and a year's worth of deodorant all in one place? However, shopping at the superstore can be frustrating, as noted by talk show host and Costco enthusiast Jimmy Kimmel. 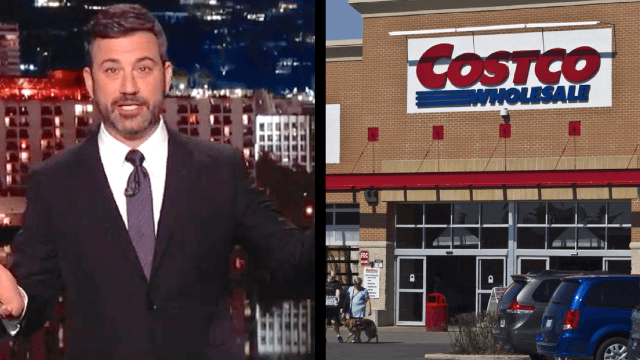 Kimmel went on a five-minute-long rant about 'Costco etiquette,' and you may just find that you are guilty of committing some of these shopping faux pas in bulk. Let it out, Jimmy. Let it out. Kimmel went off on everything from the plight of navigating cart traffic in the store to the "wedge issue" of samples. "Some of these monsters will form a circle around the sample table," raved Kimmel, adding, "It's not a wedding!" He closed his epic rant by slamming the clothing selection at Costco, calling it a "form of birth control." "No man in a purple Kirkland polo shirt has ever felt the touch of a woman," concluded Jimmy Kimmel. But hey, no hard feelings if your wardrobe is mostly comprised of Costco fashion staples. Just drown those sorrows in a vat of Kirkland brand ice cream.